Matthew Rolston's photos depict the gender-bending Warhol era in his latest monograph Hollywood Royale: Out of the School of Los Angeles. The book features portraits of celebrities and "Old Hollywood" luminaries including Michael Jackson, Madonna, Prince, and Cyndi Lauper. One of a handful of artists to emerge from Andy Warhol’s celebrity-focused Interview magazine, Matthew Rolston is a well-established icon of Hollywood photography. 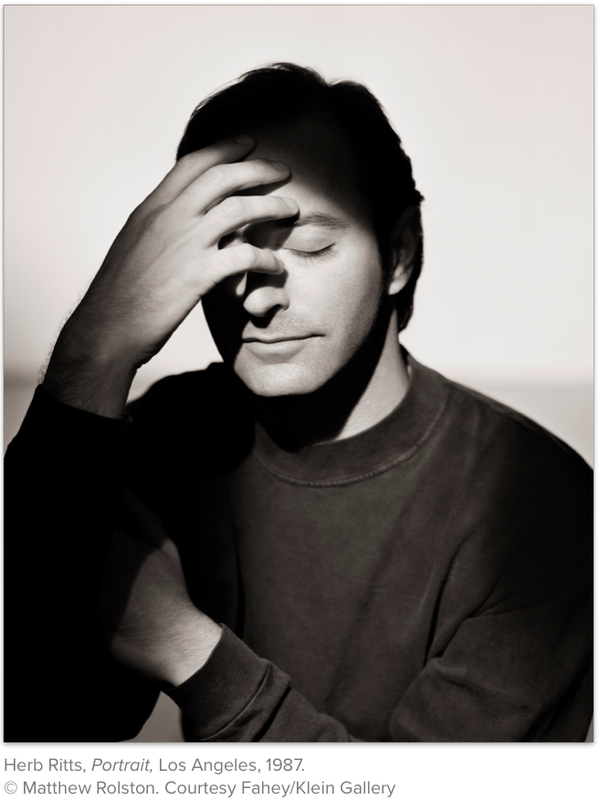 Alongside such luminaries as Herb Ritts and Greg Gorman, Rolston was a member of an influential group of photographers (among them, Bruce Weber, Annie Leibovitz, and Steven Meisel) who came from the 1980s magazine scene. Rolston helped define the era’s take on celebrity imagemaking, gender bending, and much more. Edited by long-time Los Angeles–based gallerist and curator David Fahey, this book—Rolston’s fourth monograph—presents a stunning array of portraits that beautifully and succinctly capture the decade and its myriad talents. From Michael Jackson and Madonna, to Prince, George Michael, and Cyndi Lauper, the selection of images reflects a seamless blend of style, skill, and scintillation. This volume features over 100 mesmerizing photographs selected from Rolston’s extensive body of work, centering on his unforgettable portraits of the era’s most famous personalities. With essays by authors Pat Hackett, Andy Warhol’s longtime biographer and diarist; Colin Westerbeck, noted photographic curator and expert on American photographer Irving Penn; and Charles Churchward, longtime creative director of Vogue magazine and author of The Golden Hour, a definitive biography of Herb Ritts, Hollywood Royale: Out of the School of Los Angeles, paints a fascinating picture of an indelible imagemaker and the movie stars, models, and artists he immortalized during this period. Rolston’s photographs recall the glamour of Old Hollywood with postmodern irony, helping to point the way towards the cult of fame we live with today. Before I met Matthew Rolston last week for dinner at SoHo House in Berlin, I was not aware to which level he had extended his spectrum of work. I first became familiar with his work in magazines like Rolling Stone Magazine, Interview, Vanity Fair, etc and I had always observed his visual language as he was also an Otis Parsons Alumni like me, just some years earlier, and when I started working as an Art Director I was strongly influenced by his artwork like so many others of my generation. This month you will see a great selection of 20 years of photography in his Berlin exhibition “Hollywood Royale” at Camera Work, which shows mostly works from the early 80s to the early 90s, an era when he had many assignments by the Hollywood elite like Madonna, Jack Nicholson, Sylvester Stallone, just to name a few. He is a master of detail and has been involved in creating images almost all his life. After attending various California art schools, he now holds an Honorary Doctorate from Art Center College of Design in Pasadena, where he studied photography from 1976–78. His work is legendary and his way of storytelling with images makes him one of the greats in American photography. I had the pleasure to visit him the next day at Camera Works, the Leica Gallery in Berlin where the installation of his show was in full process. When he gave me a tour through his exhibition and told me the stories behind the images, I felt back in art school in Los Angeles where image making is a way of life and there is so much more to learn. That is why I highly recommend to buy his latest book Hollywood Royale by teNeues Publishing, the book is not only an overall oeuvre of his work but his essays and even picture captions are full of information that will make you think and smile. IRMA: What does it mean to you to exhibit your work at CameraWork in Berlin? Matthew Rolston: I am honored to have my work shown at a gallery with the wonderful history of Camera Work. This is a gallery that has shown the works of the greatest editorial photographers of all time, such as Richard Avedon, Irving Penn, Herb Ritts, Patrick Demarchelier, Helmut Newton… I could go on and on. It is such a joy to see my works on the wall in this beautiful and historic space. IRMA: Tell me about a set up of portrait shoot. Matthew Rolston: It is always my goal to surprise my audience with an image that challenges their perception of a particular subject. I like to think of my photographs from the 1980s as attempting to be entertainment experiences all on their own. And I often leave small clues behind in my images that might amuse my audience with a sly touch of wit. For this image of Madonna, it’s important to remember the context of the period. Madonna was widely known as the “Queen of Reinvention,” because for almost every new song, album cover, video, etc, she presented herself in a completely new or different way. Another element to remember is that the 1980s saw the beginnings of a shift in traditional gender presentation – particularly in the pop music world, and we are living with the results of that shift in the pop culture of today. The current trend of gender fluidity isn’t really new. This is when it began. A few more things to point out in this image. It’s not really backstage anywhere, it’s a SET of backstage that I had built in my studio. On the back of one of the scenery flats is a sign that says “No Smoking.” But of course, rule-breaker Madonna is flaunting a lit cigarette. One of Madonna’s biggest hits at that time was the song “Lucky Star,” and if you look very closely at the image, you can see clearly that the cigarette is labeled “Lucky Strike.” And of course, the use of the words “Good luck” in the mirror inscription also refers to Lucky Star. Another interesting note, Madonna had never been dressed as a man to this point, nor made to look like Marlene Dietrich or referenced the post-Weimar style that von Sternberg and Dietrich brought to Hollywood in the 1930s. Clearly, this image had its own effect on Madonna personally, because four years later, she presented herself almost exactly in the style of my image for the video “Vogue,“ directed by David Fincher in 1990. IRMA: You are very passionate about detail; can you tell me a story of one of your works where a tiny detail made the path for an entire story. Matthew Rolston: Detail is very important to me. I’m not sure that I can name one specific time where a detail paved the way, but I firmly believe that even the smallest details carry enormous importance. The audience is always searching for meaning. It’s a natural instinct. IRMA: Where do you find references and inspiration today, in a social media and digital driven world. Do you work with SM influences which added a new kind of language to photography? Matthew Rolston: I am actually very, very new to social media. To promote the Hollywood Royale project, as well as my latest fine art exhibition (called Art People, debuting in Los Angeles next week), I have finally created social media accounts. But for me, inspiration can come from anywhere. My antenna is always up, and it’s always receiving. Of course, I’m looking at the history of photography, but also classical art, architecture and interior design, Hollywood films, all forms of music – really, inspiration can come from anything that gives me pleasure. Keying into those things that I love is how I continue to be inspired. And as far as I’m concerned, it’s the only way to live. Digital advancements have made searching for inspiration much easier, but I still believe it is important to engage with printed materials and to physically visit museums, galleries, libraries, etc, to touch, feel, and experience things firsthand. IRMA: In most of your fotos people do not smile but show an emotional strength, how do you get this strong expression out of them? Matthew Rolston: In a way (and this has been said by many other portrait artists), every portrait is really a self-portrait. So perhaps I’m instinctively searching for my own identity in the faces and eyes of my subjects. IRMA: Tell me about your Interpretation of the Seven Deadly Sins? Matthew Rolston: The seven deadly sins, also known as the capital vices, or cardinal sins, are a grouping and classification, of Catholic origin, of vices, which exist as a form of moral instruction to the faithful. According to the standard list, they are: pride (vainglory), greed, lust, envy, gluttony, wrath (anger), and sloth. The Catholic Church has used the doctrine of the seven deadly sins in order to curtail people’s inclinations towards ‘evil’ – before dire consequences or misdeeds might occur. Pieter Bruegel the Elder’s depictions of the seven deadly sins, from the Dutch Renaissance, are one of the best known of many works, both religious and non-religious, that have represented this doctrine throughout the ages, and served as my inspiration for this 1985 photographic series, shot on assignment for Andy Warhol’s Interview magazine. 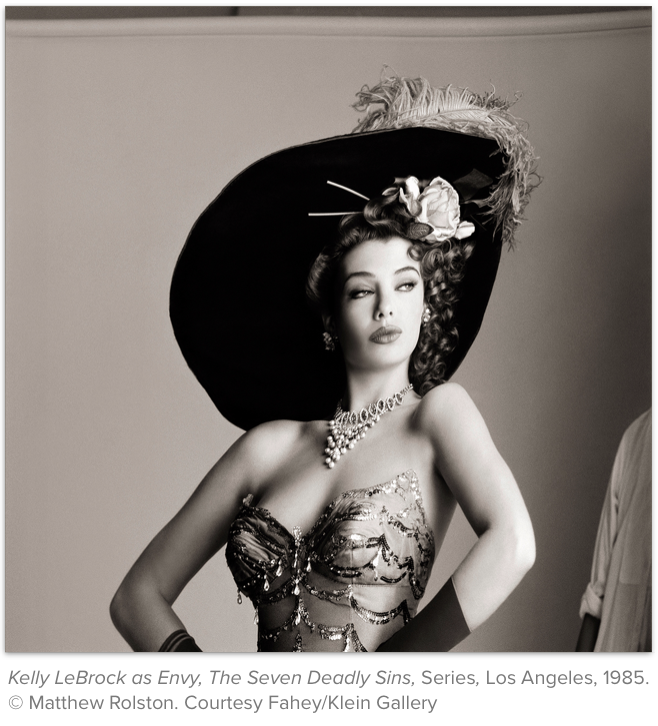 In this portfolio, American model and actress Kelly LeBrock, who, given her sensual beauty, could herself be considered a living example of lustful temptation, is shown as the literal embodiment of each of the sins, including being portrayed in the series as a version of legendary American entertainer Elvis Presley, in order to illustrate the sin of greed – in my interpretation – a greed for fame. The exhibition of Hollywood Royale: Out of the School of Los Angeles made its worldwide debut at Berlin’s CAMERA WORK Photogalerie (Kantstraße 149, 10623 Berlin) on 21 October. It will be on display there until 2 December. The exhibit will make its U.S. debut in Los Angeles at the Fahey/Klein Gallery on Friday, 2 March. Photographer Matthew Rolston has photographed everyone, from Cyndi Lauper, to Prince, from Nicki Minaj to Ralph Lauren, from Isabella Rossellini to George Michael. 'Discovered' by Andy Warhol in 1977, Rolston got his start photographing portraits for the now-iconic Interview, alongside artists like Bruce Weber, Annie Leibovitz, and Steven Meisel. Rolston—who helped define the 1980s magazine scene with his gender-bending, glamorous photos—has released a new book, Hollywood Royale: Out of the School of Los Angeles. Edited by gallerist and curator David Fahey, with essays by luminaries such as Charles Churchward (former creative director of Vogue) and Pat Hackett (Andy Warhol's biographer), the book includes over 100 of Rolston's most iconic portraits recalling the glamour of old Hollywood. A 30-image traveling exhibition is in the works. I love to report on and own music photography books. This book, Hollywood Royale from photographer Matthew Rolston caught my eye today. Matthew Rolston started his career as a “discovery” of Andy Warhol for Interview magazine. Soon after, he began shooting covers and editorial assignments for founding editor Jann Wenner of Rolling Stone, as well as for other established publications such as Harper’s Bazaar, Vogue, Esquire, Cosmopolitan, and The New York Times. There have been several lush coffee-table books showcasing Matthew Rolston’s iconic portraiture, notably beautyLIGHT and Big Pictures, but his latest monograph takes the important next step of contextualizing him from an art-historical perspective. 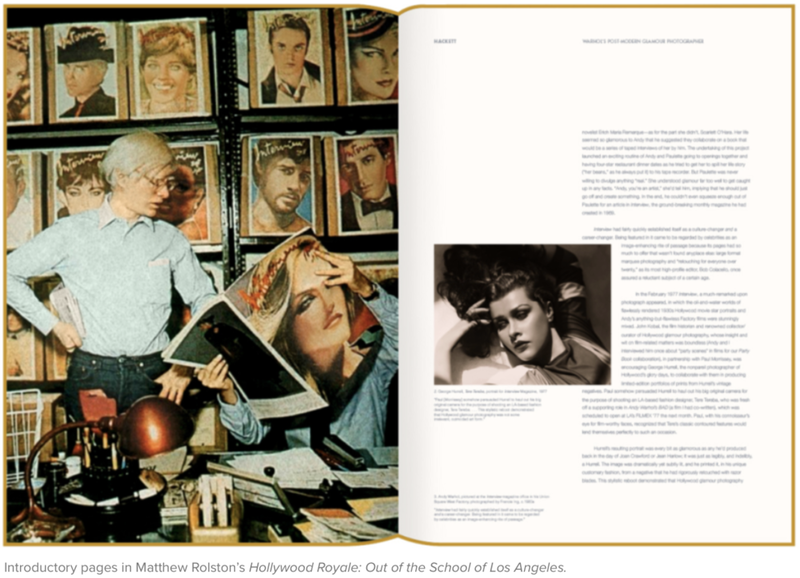 Hollywood Royale: Out of the School of Los Angeles examines Rolston’s contribution to the standard-setting era of 1980s magazine photography, a period that also saw the emergence of legendary image makers Greg Gorman, Annie Leibovitz, Steven Meisel, Herb Ritts, and Bruce Weber. Hollywood Royale, to be published October 15 by teNeues of Germany, is a 270-page volume presenting a retrospective of Rolston’s work, with a particular focus on the heady days of the 1980s, when Madonna, George Michael, Michael Jackson, Prince, and other indelible pop stars, models, and celebrities ruled popular culture and blazed new trails in gender presentation and personal style. Rolston photographed them all, producing classic portraits that set the bar for generations to come. “Upon delivering his prints to Interview, Rolston explained that Davis’ song lyrics about unhappiness and romantic betrayal had inspired him to recreate the scene from Sunset Boulevard where Gloria Swanson/Norma Desmond, having attempted suicide in a bid for sympathy from William Holden, is lying in bed with bandages on her wrists,” writes Hackett. Hollywood glamor has been one of Matthew’s signatures ever since. Ultimately, though, Hollywood Royale is as much a history of Hollywood glamor as it is a compendium of Rolston’s work. The unforgettable style of Hollywood’s golden age in the Thirties and Forties had, by the early Seventies, become debased, only to be revived late in that decade and into the Eighties by Warhol, Helmut Newton, and Hurrell himself, who each put his own unmistakable stamp on the photographic art of seduction. Hollywood Royale looks at how that revival influenced the next generation of photographers, Rolston among them.Hollywood Royale features more than 100 photographs and was edited by Los Angeles gallerist David Fahey. The images span a host of photographic techniques, from classic 8×10 camera portraits to more stylized experiments in cross-processing, multiple exposure, and high-contrast color. 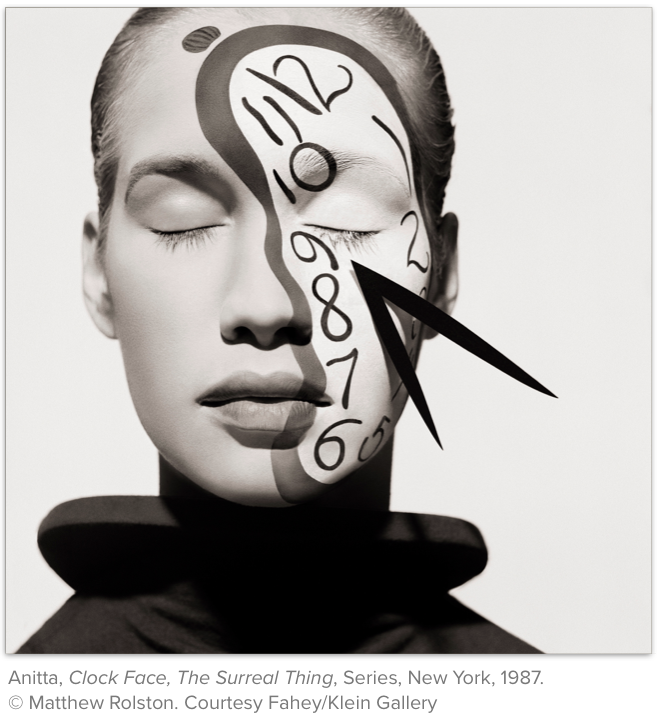 The book also includes essays by Colin Westerbeck, noted photographic curator and expert on American photographer Irving Penn; and Charles Churchward, longtime creative director of both Vogue and Vanity Fair magazines and author of The Golden Hour, a definitive biography of photographer Herb Ritts. Hollywood Royale will make its European debut on October 21 via an exhibition at Camera Work Galerie in Berlin, where it will be on view through December 2. The show will then travel to the U.S., where it will be on display at Fahey/Klein Gallery in Los Angeles from March 2 to April 21. To learn more about Hollywood Royale, please visit hollywoodroyale.com. Hollywood Royale is available at amazon.com. Back when I was a 90’s kid, I thought Matthew Rolston was only a music video director. He made visuals for top hit sons like “Bootylicious” by Destiny’s Child, “Whattaman” by Salt-n-Pepa, and my personal favorite, “Creep” by TLC. Fast forward to around 2010, and I was thumbing through a use book store and I came across Big Pictures: A Book of Photographs by Matthew Rolston. I remember thinking, “oh that music video director guy. He’s a photographer? Really?? To this day, I don’t know if I’ve seen a more captivating image of a woman. Soon, I discovered that Matthew is one of the greatest photographers of our time. He was discovered in art school by Andy Warhol, who put Matthew to shoot for Interview Magazine. Before long, Matthew was cranking out covers and stories for Interview, Rolling Stone, Vogue, Harper’s Bazaar, GQ, W, Esquire, and Cosmopolitan, among many others. His commercial clients include L’Oreal, Revlon, Estée Lauder, Clairol, Levi’s, Pantene, Elizabeth Arden, Gap, and Polo Ralph Lauren. Matthew’s even extended his talents to Creative Direction for brands like Target, The Redbury Hotel, the Lifetime Network, and Dark Horse Vodka. Matthew’s unusual, at least to me. When I hear the word postmodernism, I often think of deconstruction, and even laziness – as if reinventing something is enough to make it interesting. But Matthew’s pictures, many of which are inspired by early-20th century glamour photography, are well thought out and flawlessly executed. Yes, he’s taking influence from the likes of George Hurrell, Irving Penn, and Richard Avedon, but unlike many postmodernists, he’s not mocking or making fun. Matthew is elevating and paying tribute. I view some of his pictures as a sort of high-brow, flawlessly executed remixes. So let’s talk about Matthew’s latest book, Hollywood Royale, published by teNeues Media. Review Disclaimer: teNeues Media provided a copy of Hollywood Royale for my review. Additionally, all links to Amazon in this article are affiliate links, meaning I receive a portion of what you purchase through those links. While I do my best to stay objective, you should be aware of these relationships. Hollywood Royale is a retrospective of Matthew’s work starting from the late 1970’s and into the 1990’s. The cover is a bit of an oddity. It’s a book of celebrity portraits, and 99% of people wouldn’t be able to name the person on the cover! I never would have guessed, even though Prince is one of my favorite musicians of all-time! It’s 278 pages long, and includes 150 images, equally split between color and black & white images. The essays are a nice addition, and give us expert views on Matthew’s unique ‘old Hollywood glamour meets modern celebrity’ style. I particularly enjoyed Mr. Churchward’s, which discusses Matthew’s role (along with Herb Ritts and Greg Gorman) in elevating Los Angeles to a hotbed of celebrity portrait photography. In those days, New York City was the center of the photography world, but this trio started a West Coast explosion, particularly with their work in Andy Warhol’s Interview Magazine. By the way, if you’re ever looking for inspiration, Interview still publishes some of the best portrait photography out there. UPDATE: Sadly, just days after this article was published, Interview Magazine announced it was closing down. That’s said because it introduced me to so many great photographers like Craig McDean, Sebastian Kim, and Gregory Harris. Hollywood Royale is itself a beautiful object, and a real attention-getter. The print quality is stunning, right up there with the best-printed books I’ve ever seen, like Albert Watson’s UFO and Michael Thompson’s Portraits. In fact, I was tempted to cut out Matthew’s pictures and frame them! And this book has a very unique design feature that needs to be come an industry standard: none of the horizontal images are spread across both pages. Instead, they fold out, which is very convenient. Most photo books spread images across the spine, which is annoying if the subject is in the middle. So let’s go through some of my favorite photos from Hollywood Royale. I’m using embedded images from Matthew’s Instagram for convenience’s sake. And this portrayal of actress/director Jody Foster, as well, a director! So is there anything I didn’t like about this book? Well, there are no page numbers, which is a little annoying. And monographs typically have a guide to the images at the end, so you can see where and when they were originally published. When I see a portrait I really like in a book, I like to hunt down the original story so I can see other pictures from the session. These are relative minor issues. I adore this book for its incredible design and gorgeous pictures, and I added it to our best portrait photography books article. If you are a broke photographer, or you just don’t like to spend a lot of money on books, I would get Matthew’s excellent Big Pictures book instead of this. But if you are looking for a beautiful book with beautiful pictures, Hollywood Royale fits the bill. In fact, it makes a great gift for Hollywood/movie buffs that would appreciate a dramatic, eye-catching coffee table book. I can’t emphasize the phrase “eye-catching” enough. The cover portrait of Prince just begs people to ask “who’s that?” and to open the book. If you’re interested in picking up a copy, go to hollywoodroyale.com to check it out. Copyright © Matthew Rolston Photographer, Inc. All rights reserved.